Most people have their custom blanket manufacturer that they have always trusted and believed in. But if you are new to the blanket business and want to make contact with the reliable blanket manufacturers in China, then I will guide you with a few tips that will help you pick the right blanket manufacturer. How to find blanket manufacturers in China? To find a professional blanket manufacturer that can produce your custom blankets in bulk, you need to find blanket factories or blanket manufacturers that have their own manufacturing plant. The blanket suppliers and distributions are not your search purposes since they usually only have blankets in stock; the blanket trading companies are not your ideal search results since they lack the competitive factory direct price. So the right Google search terms will help you filter most inaccurate results. Here are some search phrases recommended: blanket manufacturer in China, Chinese blanket manufacturer, custom blanket manufacturer China, China blanket factory, Private label blankets, custom logo blankets wholesale China. Remember, if you don’t need spot blankets, then don’t choose search phrases like wholesale blankets and bulk blankets. If you need specific blankets types, you can add the material to your search phrases, such as wool blankets manufacturers in China, China fleece blankets manufacturer, etc. Generally, the Google SERP will include many Google Ads (results with green Ad label) and organic search results as pictures below. a. As you can see, a part of the organic search results is some world’s famous e-commerce platforms like Global sources and Alibaba. Because of their huge traffic and high site authority, these e-commerce platforms usually have the highest rank on Google, and we will tell you how to find blanket manufacturers by using them later. b. Another part of the organic search results is some blanket companies’ official websites. As we know, Google is very focused on the user experience, and it is trying to show us the great content and websites. So there is no doubt that these blanket companies shown on the first page are strong enough and their sites usually have high traffic and perfect user experience. You can pick and choose the blanket manufacturer you really need by checking a site page’s title and description in Google organic search results. When you visit one blanket manufacturer’s website, you’re supposed to focus on their past work, service provided, and some related certifications, of course, you can contact the manufacturer online or send them emails for further details. All things you do is to ensure whether this company can produce your blankets and whether it is a reliable manufacturer. c.You can click Google Ads results showed to visit their websites. Different from Google organic search results, these websites can show on Google’s first page easily by a high bid, so you need to confirm whether these manufacturers are experienced and strong. You can check their site traffic by Semrush and see their past work and certifications. Direct interaction with the potential blanket suppliers will let you know what they are capable of offering. There is two famous trade show in China every year, they are Canton fair and the East China Fair. East China Fair (ECF) is the biggest regional trade fair in China with a great variety of exhibits and the most traders. 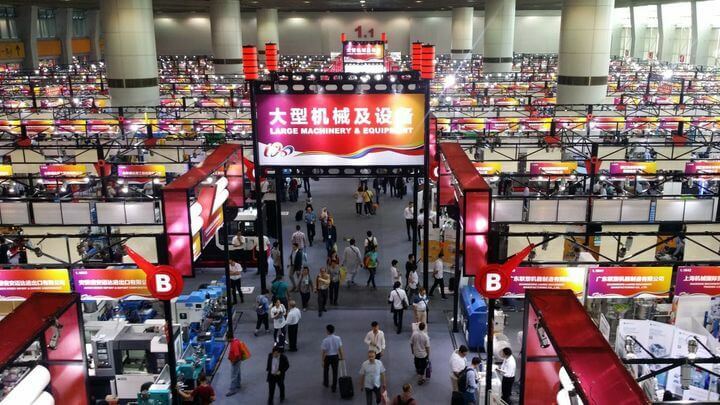 It is held once every year in Shanghai and the 29th ECF will be held at Shanghai New International Expo Center, on March 1st to 4th, 2019, with an exhibition area of 125,000sqm with 6,580 standard booths available. Maybe the fair can help to find some great blanket manufacturers in China. Note: There will be some similar sellers and repeated products on the trade fair, you are better to communicate face to face with all of them before making your decision. Alibaba.com is the largest B2B marketplaces in the world, and you can find most of the Chinese manufacturers and suppliers on it. How to use it effectively? For example, I want to find some Chinese Sherpa fleece blanket manufacturers, so I will use search phrases like Sherpa fleece blankets. As shown in the image below, I also selected options like Trade Assurance and Verified Supplier to narrow down the scope of the search. Of course, you can select other options on the right side of the page based on your needs, such as Top 3 markets, Mgnt Certification, R& D (OEM, ODM, Self patent, Self brand), and No. of Employees. In general, there will be so many search results (companies) that will make it hard to choose. To avoid being scammed, I personally think you’d better choose 3rd year + Gold suppliers, and choose suppliers who can accept credit card or PayPal payment methods. Note: Suppliers on Alibaba.com can pay to have a “gold supplier” status, and pay for each keyword they target. So I think you’re not careful enough while choosing the suppliers, and maybe you need to read some articles about how to find high-quality suppliers on Alibaba. Global Sources s a Hong-Kong based B2B media company and has been in this business for about 40 years. I think you can get more large blanket manufacturers and run lower risks of being scammed on globalsources.com. The manufacturers and suppliers on this platform should pay lots of money to get a premium profile (more than on alibaba.com), and they can’t pay for keywords they target. You can find a good sourcing agent when outsourcing blanket manufacturing. And the agency will help you in searching for a professional blanket manufacturer in China. One of the best places is LinkedIn since there are many groups dedicated to China business and International trade. How to select the right blanket supplier from your list? At first, it’s necessary to identify the number of products you’ll be buying. Blankets production is quite simple and direct. This is the main reason why there are plenty of manufactures involved with blankets. When you are dealing with items that have low value in China, there is a probability that manufacturers won’t do a custom product for you or even sell you an item if the amount you’re buying isn’t plenty. Ensure that the company’s name is the same as the product that you need. Companies with “blanket,” “textile” or “fabric”, shows that they concentrate on mainly of this sort of products. If you see something like “Promotional Product Company” or “International Trade Co in the company’s name, then they are probably trading on many items. If the name doesn’t have any relation with blankets or textile, then it’s most times a trading company. Make use of the MOQ and prices as a just reference. The listed prices do not always match the bid offered by the supplier. We realize that suppliers attract customers by reducing the listed prices. Don’t allow the rate of prices stops you from asking about a product. You should always bargain the MOQ. Most suppliers put most ideal MOQ’s like the order size, but this is done just to get you in business. They will definitely reduce the MOQ to get an order from you. MOQ’s are indirectly proportional to the price of a piece. Paying a higher amount for a piece at first is always good, as you reduce chances of risk and test the capability of the product. As you go through company pages individually, ensure you search for the reliable line of product. If you notice that all kinds of products are being sold on a page, then it’s probably a trader. You should also check for an audit from the Alibaba factory. Go through the page and search for the precise description of products with their images and specification. Disarranged product pages could mean that it’s a trading company. The factory images and amount of sales could be listed on pages and can be used as the reference. However, do not take it seriously. Most of these pictures are faked, and the sales amount is inflated. See if the suppliers could answer detailed questions from you. Make use of chat or skype call to ask detail questions. If you don’t have an idea of the products requirements then ask a lot of easy questions. Normally manufacturers know all about their products, so they aren’t afraid of answering questions. If you ask a chain of question about the requirements of this product and they aren’t answered at once, then its probably a trading company. There will be questions that the sales manager isn’t sure of and need to get to the engineering department or the manager to get answers, but the sales person should be able to properly answer most. Asking complex questions will show the supplier that you have an idea of the supply, therefore they will probably give you a quote at a standard rate. They will think you will turn down their offer if it’s too expensive since you are well educated about the subject. After focusing your option to suppliers, you can make use of these procedures to know if it’s a manufacturer or trader you are dealing with. The “Business Scope” (经营范围) is the most important place to see this; it can vividly tell you the company’s operations. The business scope of a factory will consist of words like “manufacturer, producer, or processor” (制造, 生产, 加工). Normally, a trading company will certainly have other descriptions. One other place to check is registered capital. Normally factories have larger registered capital. I’m not saying low registered capital indicates that it’s not a factory, but high registered capital is likely to be factories. Everything on the website is in Chinese; however, Google translator could be of assistance. Most companies request payment for this report, but they are translating information to English which is something you can handle. In most situations, factories always have a higher MOQ than trading companies. When I’m finding factories on Alibaba or Global Sourcing, I constantly search for companies with higher MOQ’s, as they are most likely to be factories. Don’t bother about the MOQ you see, as they can be bargained. Traders can reduce the number of products if they have good relationships with factories, keep their personal inventory, or have other customers buying similar products. This enables them to sell a smaller number of goods to buyers. One of the reasons factory keeps their MOQ is that the there is a fee to create a production line for every product and raw material which is difficult to get in smaller amounts. It now becomes very costly to produce small batches for clients and the factory isn’t making any profit. Normally, I tell supplies I need a sample order at first, and then if I’m satisfied, I’ll buy a larger amount. Factories normally focus on one or various types of similar products. If the range of products in their catalog is large, then it’s most likely to be a trading company. Factories usually produce several similar products in various industries like plastic molded parts. A company can produce plastic model parts for a toy and customer appliance industry, however, it’s unusual to see a company producing plastic molded parts and electronic gadgets. Product types with a large variation range are normally trading companies. The request for an audit report when companies say that they have operated with multinational firms like; Walmart, GE, Costco, etc. carefully crosscheck these reports when you receive them. Most times these companies will audit a part of the business that isn’t related to the production of your goods. They will ensure there is an appropriate toilet for the specified number of persons in property and also if the adequate safety considerations have been put in place; example, fire escapes. Although these are very necessary, do not let them shift your view away from their manufacturing abilities. If the factory hesitates are refuses to give you this data, then they are probably a trading company. When sent an audit report, crosscheck the company and license name and ensure that they match. An ISO 9001 isn’t owned by every factory, but most of the companies that possess this is factories. A trading company will not obtain this documentation in most instances. Generally, only good factories spend time and money to get this documentation. Don’t think that all factories operate in accordance to his documentation. I have seen many factories that have this document but don’t operate according to the requirement of the ISO. Although some trading companies obtain this documentation, they most time focus on a particular product and usually have a very strong relationship with factories. I know some trading companies that work this way and provide similar rates as the factory. All goods have their personal industrial zones in China. What I mean is that most of the factories producing similar items are located in the same zone in China. The major reason for this is that a supply chain is developed in several zones, and factories make use of the sub-supply chain to competitively and effectively product goods. A good instance is Shenzhen in Guangdong province for electronic devices. There are plenty of suppliers in Shenzhen City and around Guangdong. The supply chain of everything regarding electronic devices is found in these cities. Manufacturing these items in other zones is usually more complicated and expensive, so these sorts of industries usually establish themselves around each other. If a supplier from another zone is providing electronic appliances for you, there is a high probability that it’s a trading company. Request for their address and the name of their business in Chinese, and let them know that you will search for heir Chinese business name to have knowledge on the kind of company they are, also tell them that “it’s going to be very disappointing if they aren’t honest.” Normally, they will tell the truth after this. Say you have plans of coming to their factory (even when you have no such plans) and it will be very disappointed if they aren’t honest about having a factory. Normally, they will tell the truth after this. Use the Chinese address given to you and search for it in a Baidu Map. Take a look at the street views and standard map to see if it’s really a factory. Use street view to indicate the company and see it the names are the same. Ask technical questions. Trading companies usually resist this or take a long time to reply. Now you can select a supplier finally after this procedure, order for blanket samples to check the production quality. If you are satisfied, carry on to an agreement in manufacturing your products.